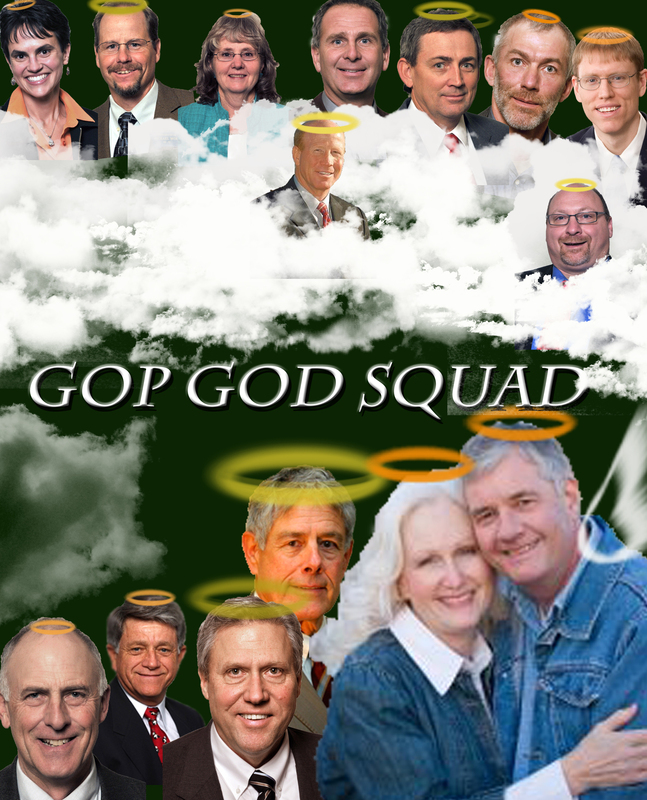 This entry was posted in 2011 Legislature, GOP God Squad, GOP Hypocrisy, Montana Medical Marijuana, Montana Reefer Madness, RINO and tagged Austin Kaufman, Dave Howard, Ed Walker, Ellie Hill, james knox, Janna Taylor, Ken Peterson, Mike Milburn, Montana GOP, Rep Hale, Rep Regier, Rev Harris Himes, Rob Cook, Rowlie Hutton, Sen John Brenden, Steve Zabawa, Susan Smith, Verdell Jackson by montanafesto. Bookmark the permalink. I thought it was a nice, but spooky touch. I doubt it was directed at all LDS members. Several of the highlights included members of the Billings Mormon community, if the same were true of Catholics, she would have used a picture of St Pius. Sorry if we offended you though….. I knew which temple it was… and you know me. I’m not easily offended. But temples hold more significance than a chapel… so it definitely made me flinch pretty hard. OK, well I don’t understand the temple significance, but because I value your friendship and opinion, I’m going to remove it. Sorry Sparky! I took care of it, Nic. Thanks for the props on the videos……there will be more. I had to stop for a while – it was making me ill. After being up there and WITNESSING it live first hand – re-living it on video is a challenge when doing HOURS worth. The reward is SO worth it though. It will be a powerful weapon/tool on the campaign trail for the next 18 months. I WILL be on it….and I’m startin at home first. I worked in state government for over TEN years – and in visiting with my “homeys on the hill” (past co-workers and supervisors – yes – we DO still communicate – and are friends!) we have ALL agreed – this has been the WORST session ever! I had another huge smile slapped on my face yesterday – when I went to visit my ex-Human Resources officer. She had to terminate me for my work injury – and we have been pretty tight buds ever since. She felt so bad she cried – and to stop her – she was one of the first ones I shared my magazine with. She has been my biggest cheerleader ever since. My homies love me……thanks for that! Thank you too Montanafesto……for giving me hope in dark times. My time on the hill truly disillusioned me – after my past years time there. I simply cannot believe what has happened this session – on so many more issues than just cannabis. Yeesh! I was just minding my own business when WHAM! We’re all “scourge” and a bunch of criminals……. OH – and you stick to your danged guns on that temple picture….. If it encourages that there temple in Billings to “police their own” so be it. I wouldn’t take it down until they do. They SHOULD get their dogs back on the leash…..they’ve freakin gone RABID and need punished for their LIES. I have PROOF of their lies on video – and I am not afraid to put my name to calling them ALL LIARS! The truth shall come forward……ALL of it.